Before using the Peachtree Inventory Adjuster on your own data, you should play around with it using the sample Bellwether Garden Supply data that is normally included when you install Peachtree. If you don't have this data on your system, you will need to reinstall Peachtree. The default directory for Peachtree will be shown when this form starts. Normally Bellwether Garden Supply will show in the Company Name panel on the left. If for some reason it is located in another directory, use the Drives and Directories lists to select its location. Click on the company name so it is highlighted as shown above, then click the OK button. The inventory adjuster includes a small default spreadsheet named PeachtreeInventoryAdjustment1.xls that is located in the directory where the application was installed. For this exercise choose this file by clicking the Open button. In the box labeled "Item ID Contains" enter B* to select only items that start with B and end in anything. 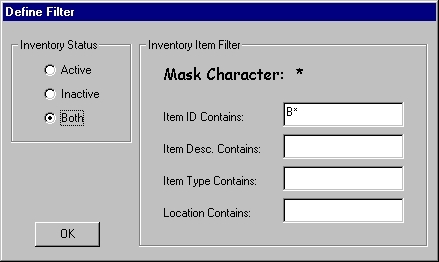 Notice that you can also set the filter to select only Inactive items or all items and can define a filter mask for the Item Type and the Location. Click OK to set the filter. Don't click the Select Account button. We'll use the item-specific COGS accounts rather than overriding the accounts. Now lets suppose we did a physical count of the BOOK items and need to adjust the last two. In the Actual column enter 5 for BOOK-11020 and 15 for BOOK-11030. We are now ready to adjust the quantities in your company data. Notice that there is a small always-on-top box in the lower right corner of the screen labeled "Inv. Adjust". Click the Reconcile button. If the Peachtree posting method is set to batch, unposted Inventory Adjustment Journal transactions will be created to adjust your company data and you will need to post the Inventory Adjustment Journal in Peachtree to complete processing of the transactions. If the Peachtree posting method is set to real-time, then it isn't possible to insert the transactions directly into the company data. Instead a Peachtree Import file c:\ADJUST.CSV is created and you must manually import the data in Peachtree to process the transactions. 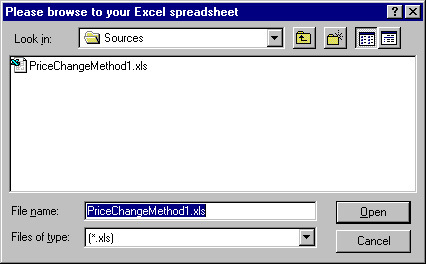 In either case after generating the transactions the Excel sheet will be closed. In Peachtree complete the transactions: If the Peachtree posting method is set to real-time, import the file c:\ADJUST.CSV. If the Peachtree posting method is set to batch, post the Inventory Adjustment Journal. Exit from the inventory adjuster and start it again. Notice that the company, workbook name, filter values and Count Date have all been preserved from your previous session. Click the View Inventory button to view the spreadsheet again. Notice that the Peachtree quantities are now the new ones you set from the last session. This is a good time to experiment on your own. Try entering different filters and changing the counts. When you feel comfortable with the inventory adjuster, you are ready to try it on your own company's data.